NEW MEMBERS - Welcome aboard!! 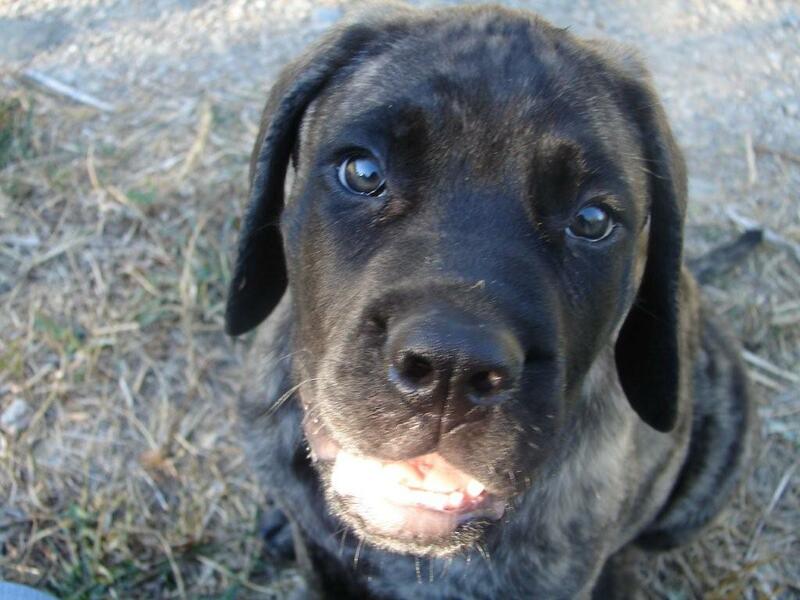 Please introduce yourself and tell us about your Mastiff :welcome1: - This Forum is brought to you by The Mastiff Sweet Spot and Friends of the Forum. Well I'm sneaking in right behind you Lyn! 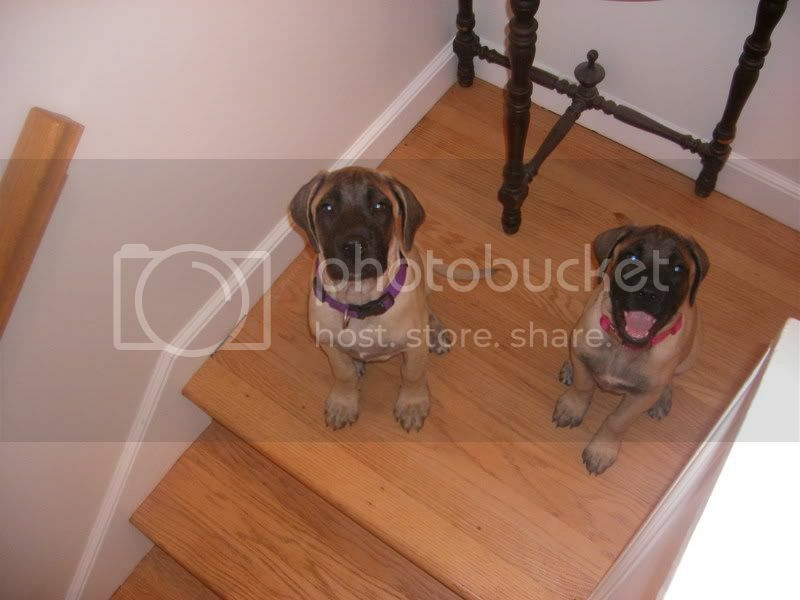 I've had Linda's Mastiff Forum as a link from my site for quite awhile now. I think it's very informative. I had the pleasure to meet Linda& her husband on the way home a few years ago. Got a great greeting from dear Sam at the door. I've had Mastiff's for 9 years now & just adore them. I live in Northeastern Pennsylvania. I recently traveled to the Netherlands to bring home a son & daughter of Erk & Tequila. Had a wonderful visit with Marc & Petra & got to see everyone I met last year. Henk's Mastiff's remembered me...oh what a greeting I got. It was the best! 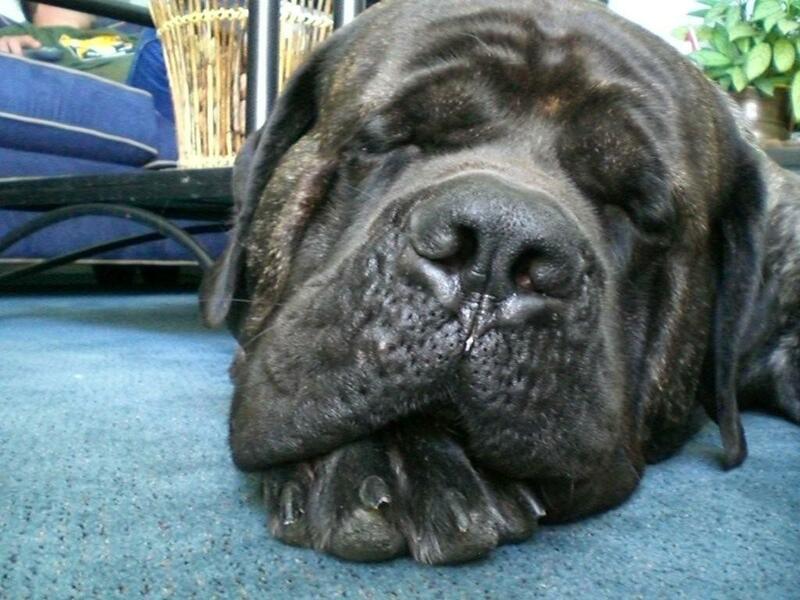 I'm looking forward to being on Mastiff overload, as a dear friend would say, from everyone on this forum. Welcome Kathy, feel I know you a bit via Mark and your mail. Mark has been great at keeping me up to date on the pups. I would have so loved to have at least seen them. I feel very strongly that when taking on a dog you need to be able to look 10 years ahead of still being able to care for them. Sadly i can't do that. I am sure you will learn a lot here and the photographs alone tell us so much. A picture we have all had at some time! I'll try to get soms pics placed! I was the one who posted the picture, I have a vast selection from before the nuptials, through the pregnancy from birth until the day they went off to their new homes, I guess I am just a proud Gran. I did speak to Mark about posting them first so hope I haven't caused any upset. We are very proud of that lovely litter. I was excited to see our puppy pic here, and very surprised! I'ts so much fun to see and hear everybody get so excited about the pup, it's a huge compliment! Next week we'll post some new pics, I just can't stop taking photo's! Hi my name is Pat, I live just south of Harrisburg PA, I am currently on my 4th and 5th mastiff. 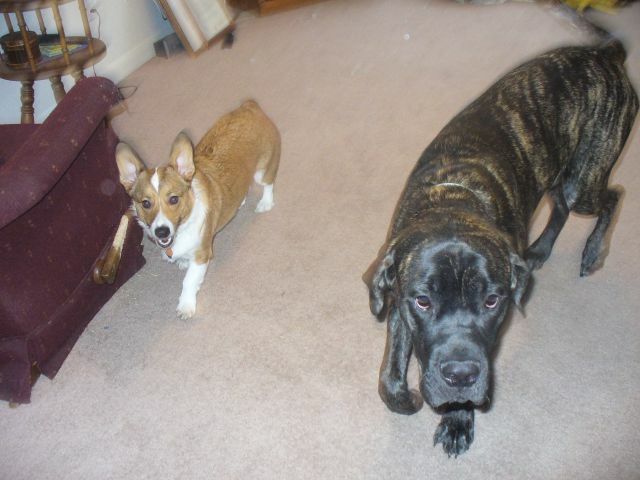 Currently I have Isaac a 16 month old brindle male and the Madame Sophie a 4 month fawn female. Hello, My name is Jerry and I am a new member here. I am a special ed. teacher and certified dog lover. I have Boston Terriers, English Bulldogs, Mastiffs, and a couple of mix breed squirrel dogs. 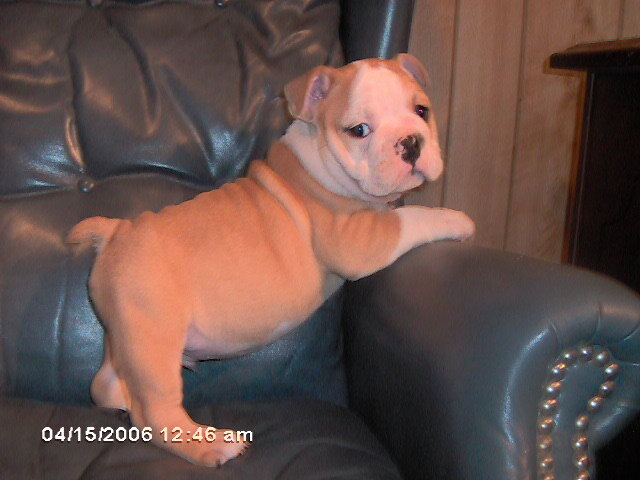 I raise bullies, all the others are just pets. I will attach pictures of some of my brood. Hi, my name is Vicky. 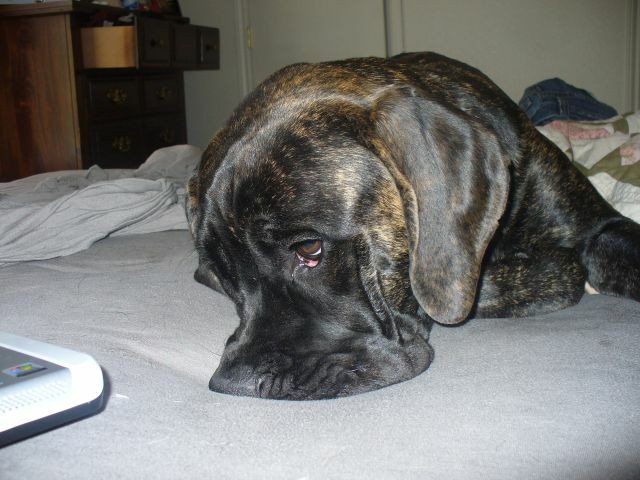 I recently lost my big Mastiff boy "Blackberry" and I am still devastated. Only one day later my new Mastiff "Reno" came into my life and he makes me smile again...I found him on a Safeway parking lot (a woman was selling 5 Mastiff puppies) I was on my way to Reno. When I stopped to "take a look" it was too late....there he was.....he looked just like my big boy, I had to take him home and I am so glad I did! He brought sunshine in our home from the first second. 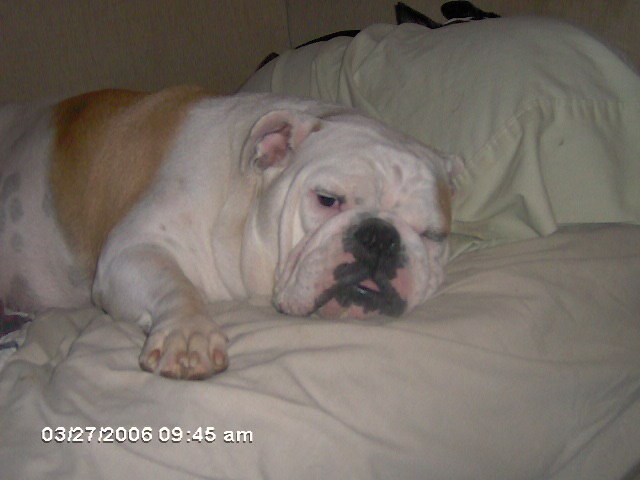 I still miss my big guy and once in a while I have to cry, because it still hurts so much. I lost my best friend. But when I'm sad, Reno brings Blackberry's favorite toys to me, he shows me how much he appreciates to become my "new best friend" He looks at me with those happy brown eyes and I can see Blackberry in him. And if he could talk he would say: "Mummy, don't be sad, I'm living on in the little guy" It might sound weird to you, but this is my only comfort and it helps. My name is Barrie (and I am a girl lol), and some of us know each other from other boards. I have been lurking for a while, which I am coming to realize is NOT fair! I feel like I know so much about some of you from reading your posts, and since I have been lurking you know nothing about me! So, I am Barrie (nope, not short for anything at all), I am a single mom in my early 40's, 3 teens at home, 2 kids grown and on thier own, 1 grandson on the way next month. I have 3 Mastiffs whom I show (all girls), 1 Labradork, 3 cats, 7 Potbellied Pigs and last but not least a Llama . . . Some of you may know that I am a silversmith/artist, oh, and I live in Central California. I tend to be an information junkie, and read on the internet way too much! So here is me, and some of the critters! I look forward to being out of lurk mode! The Brindle is MysteryMtn's Wild Thing of Sunstone AKA Libby-Terror Puppy and she is pictured with Stonehaven's One Fine Day at Sunstone AKA Kaia, and The big one is Mr A's Ocean SUnshine AKA Sunny or Princess Poopyhead . . . the human is me! My name is Michael... I am really just being a good boy and doing my research and finding out more about the breed, and try and meet some owners. We have three kids (13, 2, and 4 months), and a 2yr old Newfoundland and 2 cats. We've been interested in Mastiff's since we got our Newfoundland, and now that we live in a Single Family home are thinking of getting a pup. My name is Marc and we often read this forum. So now time to enter. When my sentence is not correct donnot mind because I am Dutch and I am not going to use a dictionary. At the moment we have 6 Mastiff's and 1 Great Dane. Our oldest is Curran he is 9. We also have his son (Sabian) and daughter. For the frequent readers the daughter is Tequila and the mother of Bacardi and Bibiana who both live in the USA now. The father is Erk. Then we have Ariba a 2 year old daugther of Tequila and then there are the two younghsters. 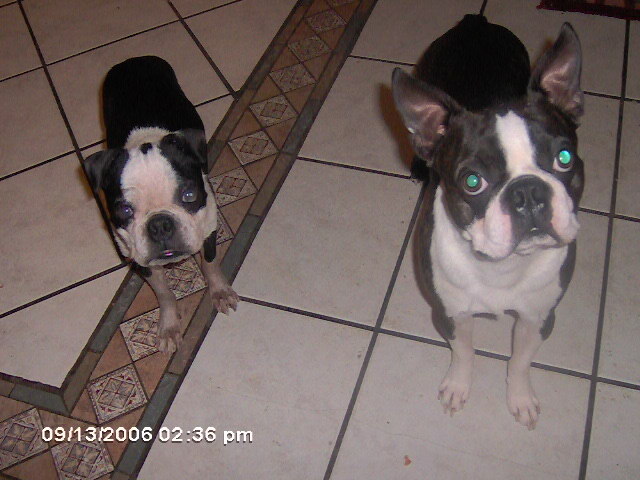 That are Basilius and Beetlejuice both brindle and brother and sisiter of bacardi. 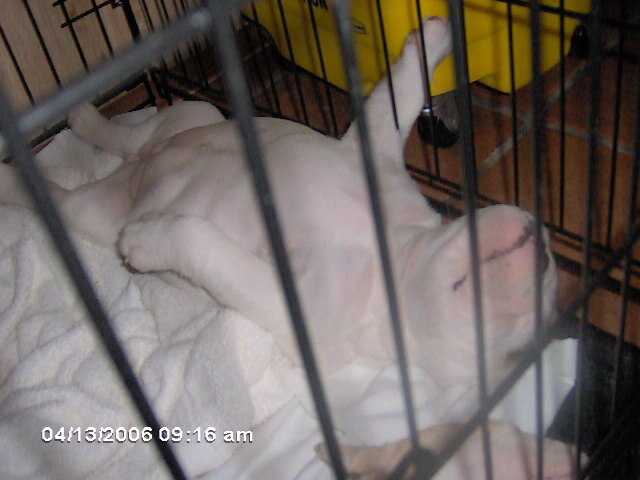 So also from the last litter of Tequila and Erk. Our Great Dane is Gianluca and 6 years. I added two pictures one with Basilius and one with Curran and Beetlejuice. I am Stacey Mom to Matty who just turned 4 and step mom to Noah who is 8. I have Mack who is my brindle puppy. Who I adore. He is Lexington's CTYankee hence the screen name. 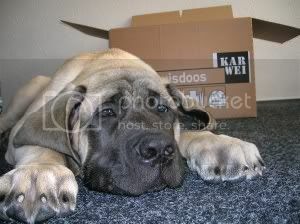 I am now addicted to learning all I can about Mastiffs. I plan to show with the help of Erica! 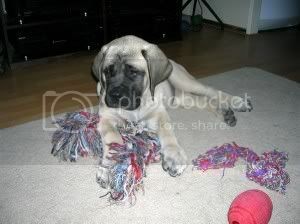 ( Lexingtons mastiff's ) and hopefully will meet alot of you face to face. Welcome Mark and Petra good to have you here, am looking forward to hearing about the show at the weekend. My name is Heather. I have been lurking on this board for awhile and wanted to join as you all seem like a great bunch of Mastiff folks that I could learn a lot from. 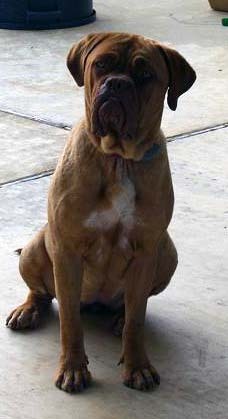 We currently have one female Mastiff named Gerty. She will be 7 years old this Halloween. We also have a cat name Kitty. We have two children. Gerty is our second Mastiff. Hi, I just joined the forum. 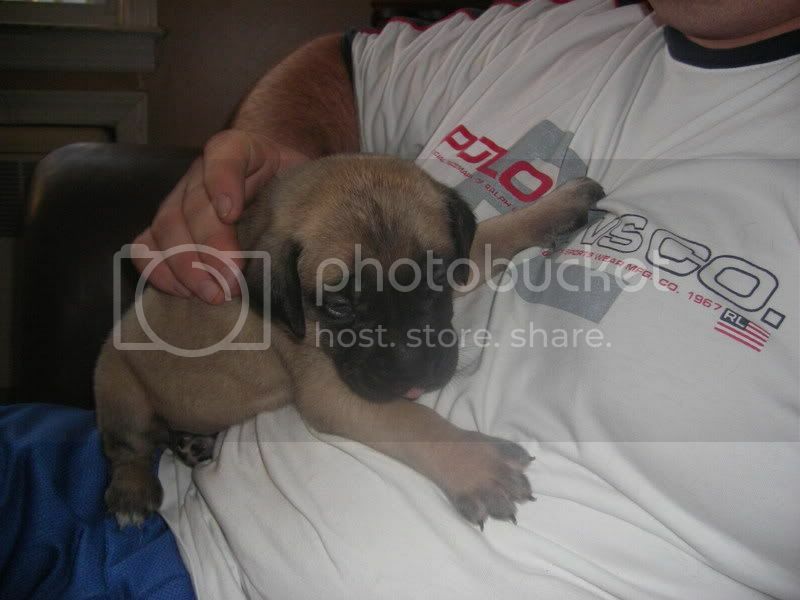 I have been looking for a mastiff forum that people actually respond to others. This one seems like people respond. 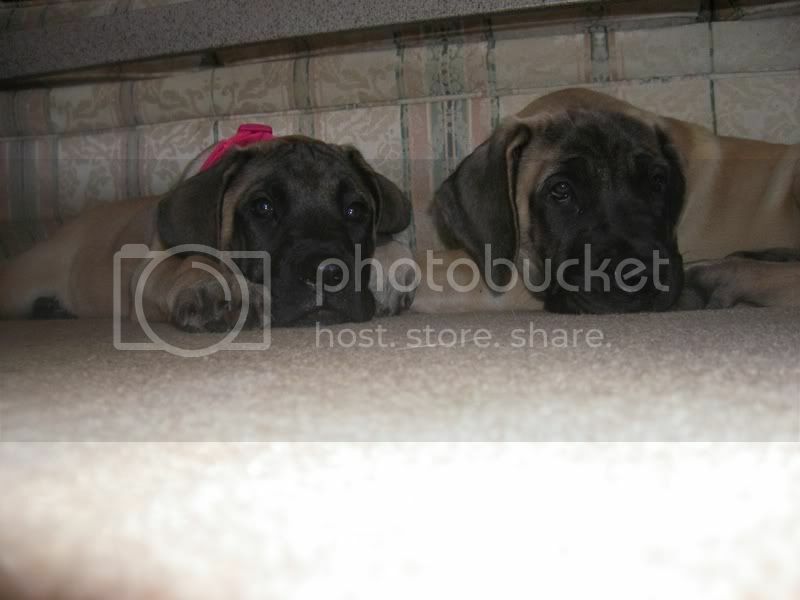 Anyways, I live in CT with my fiance and we just bought a house and got 2 mastiff puppies (yea it was a crazy thing to do but its been fun so far). Their names are Madison and Holly. They are 3 months old and very big. I have always had mixes so it will be interesting to have pure breed. I worked in a vet office for almost 6 yrs and never saw a mastiff. Our friends had a litter and offered the puppies to us. Madison is the biggest female in the litter and Holly is the runt. Their personalities are like day and night. Madison likes to cuddle and sleep all day while Holly wants to constantly be doing something. Well here is some pics of the babies. HI! 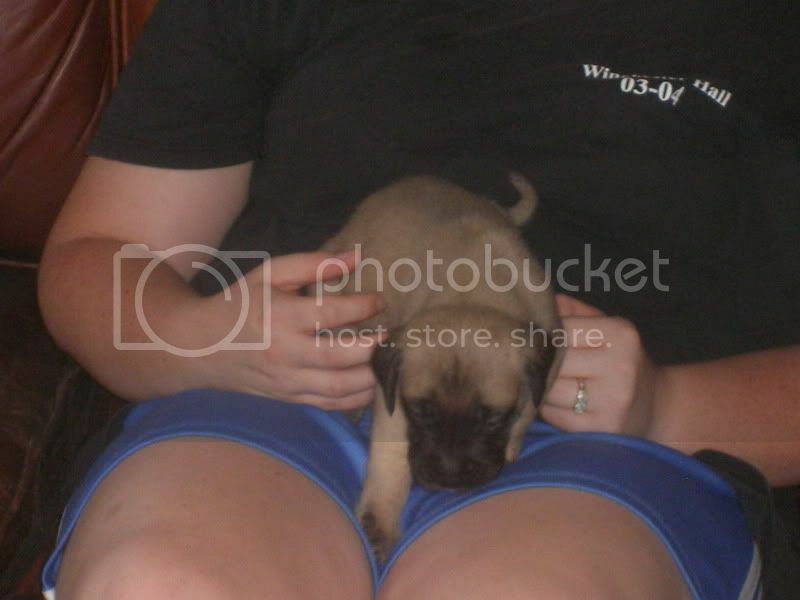 My name is Adelle and we will soon be getting our first Mastiff!! My husband and I are buying our first house and will be moving in in the beginning of November. 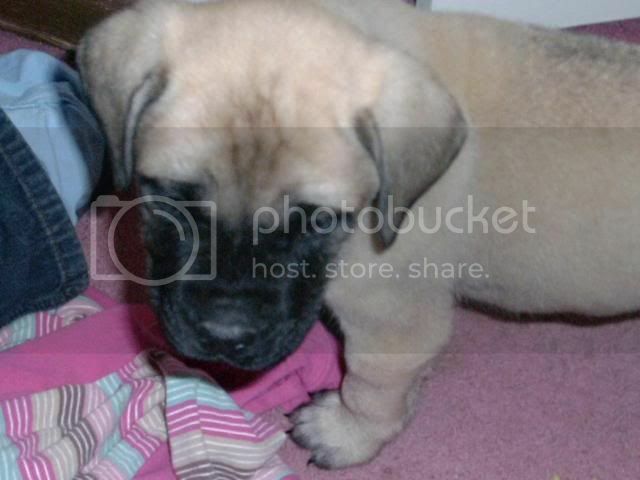 After tons of research, we decided we REALLY want a Mastiff!! We'll be getting one from the local Mastiff rescue once we move and they find the right fit for us (they only have 1 in rescue right now and we weren't right for him). I grew up with horses, so they aren't *that* big to me. Just the right size!! We're so excited about the newest edition to our family (although we haven't met them yet). I just wanted to say hi and meet all of you. Your pictures are sooooo cute! I can't wait till I have some of my own to post! I have been reading on this board for quite some time now and I finally decided to join. I didn't want to miss out on all the fun! 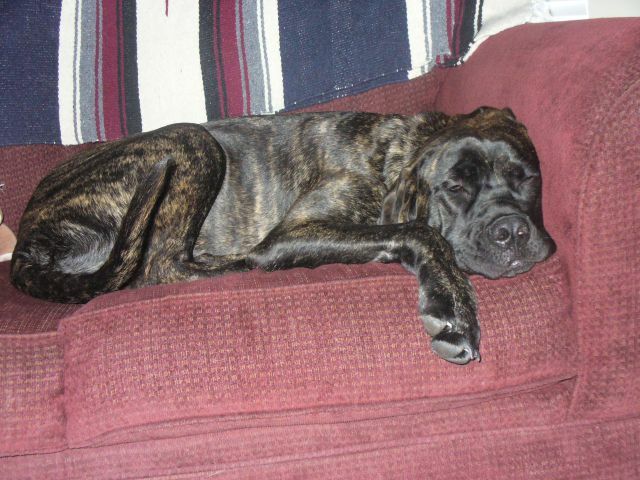 We live in Canandaigua, NY, have three children (ages 4,5 and 8) and one mastiff (Tess). I really look forward to all the information I can gain here. Hi! My name is Anne and I live in northern WI with my boyfriend Andrew. We have 3 great dogs, Suki, our about 10-year-old Akita we adopted from MARS, Timber, about 6-year-old Shepard/Husky mix we adopted from our local animal shelter, and Quinn, our Mastiff! Quinn just turned two last Monday, October 22. All of our dogs are sweet, but there is something special about Quinn (as I know you all know!). I just started volunteering for GLMR and used to volunteer for a greyhound organization. Andrew is a conductor for BNSF RR and I am a victim/witness advocate in the county attorney's office and I play rythym guitar and sing lead in a band. Our children are all adults (whew!). I look forward to getting to know everyone. Blessing is walking the dogs on a cold, starry night. My name is Kelly and I am the CO- State Coordinator for Southern States Mastiff Rescue. I am also an active foster mom / home for SSMR and the ABA Rescue. 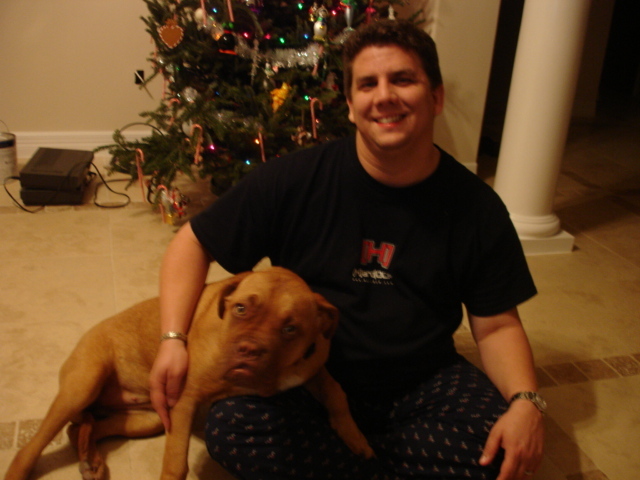 My husband Matthew is the reason I fell in love with the breed. He had a BYB Girl named Morgan. She passed while we were still dating. I always wanted a mastiff again. So I figured instead of getting on from a breeder I would adopt from Rescue. That is how I started volunteering for SSMR And the ABA Rescue. My 3 Foster Mastiff was General Stonewall Jackson The love of my life. He was 8 when his lifetime owner who was moving to Assisted Living surrendered him. General Mourned for a week before he came around. He is now 10 and going strong. I have a bossy little mutt female named Annie who was a pound puppy. These big guys are wonderful and so special that I would not trade it for anything. I don’t breed and I don’t show, I rescue. I have been lurking here for years but figured I better do the right thing and introduce myself. My name is Wendy and I live in NH on 3.5 acres of land bordered on two sides by 160 acres of recreational land. I am a neonatal nurse practitioner, wife, mother of 5, grandmom to 3 (and another little boy on the way. 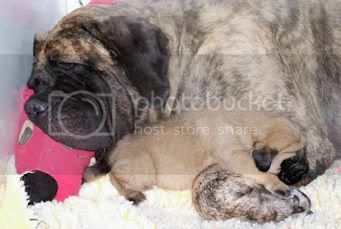 I have owned Neapolitan Mastiffs for the last 10 years or so and currently have a 4 year old male named Zander. I also have a French Bulldog female who is 1.5 years old - Sassafras is her name. My latest addition is Cowboy Troy! He's 12 weeks old and sweet as sugar. We have always loved the mastiff breed and wanted one of her own for years. Finally, we were able to go forward with that dream with Cowboy Troy. Our current neo is special needs - he developed serious neurological problems requiring multiple surgeries over several months when he was just a year old. He is on high dose steroids to manage spinal cord issues plus he is On Neurontin for neuropathic sensations. He is the sweetest and best neo we'ver ever had. We bought him to show him. He did get through one show in Canada then it all fell apart with his neuro problems. Sassafras came to be a companion to him after we lost our two other neos. She became his best friend and the two of them have a wonderful relationship. Now she has Cowboy here to play with and all is perfect in her little world! 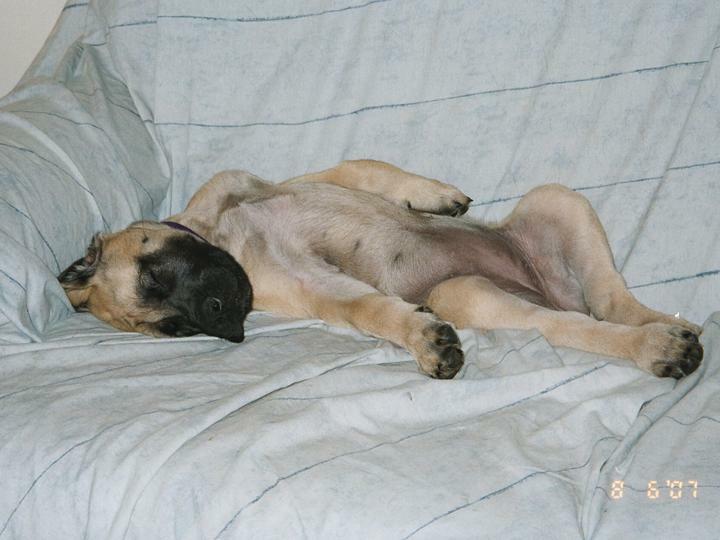 Anyway, that is my story and how I have come to be part of the mastiff experience. I am glad to be here and have learned so much over the years reading the threads here. My name is Tracie,I just joined today. I have a 6 1/2 month old mastiff puppy named Ruby, a 11 year old German Shepperd/lab mix from the SPCA and a cat. My puppy has been a wonderful addition to our family. 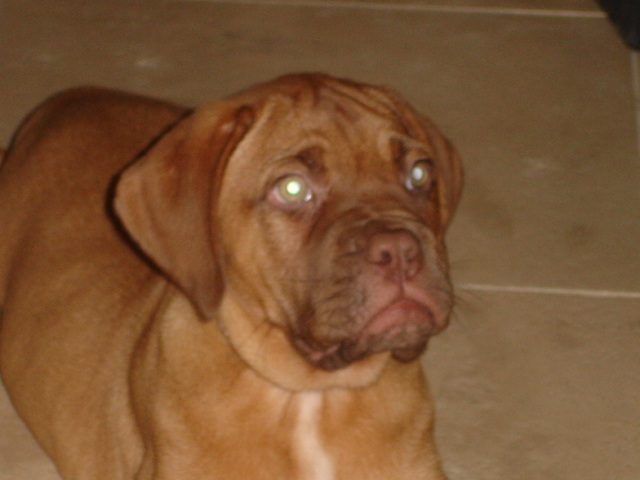 We spent a long time researching breeds we choose the Mastiff. I know we made the right choice. She is very calm and loving. We are currently enrolled in our second puppy class (advance puppy) and I hope to show her. When we're not out showing i keep busy with the local kennel clubs and our Local Children's Hospital . Thankyou for letting me join and i want to say i've really enjoyed reading the posts, especially the historical info. Welcome, I am from the UK just below the Humber, in the wilds of Linconshire. Karen - you are a wonderful gal - "just three" - I love it!! I wish everyone thought that way.. actually, I see that many of you do. 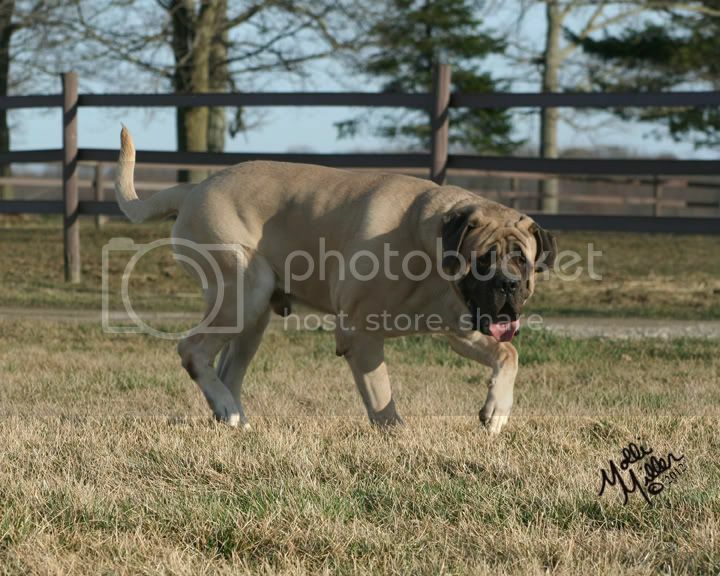 These mastiffs are such a great breed it is hard to own just one. Wendy - that Zander is such a beautiful dog. I wish we had that color in the Mastiff. It would surely be my favorite. Welcome to all of you. It is so nice to read about you and your families. It helps all of us to feel closer to you when we can put a person to a dog's name. Well, that didn't come out right but you know what I mean. Welcome! Thanks for the welcome Linda,and Lyn i'm from Lowton- St- Lukes in Lancashire, it's between Liverpool & Manchester off of the east lancs rd. I am excited to find this forum, it does seem very friendly & informative! I am interested in learning more about the English Mastiff as I am trying to decide if I want an English or another DDB in 2008. I have a wonderful spayed DDB female who is just a joy. She is almost 2 years old. Her name is "Kissy." We are working on training for Novice obedience, hoping to compete in the late spring or even summer. Taking our time, enjoying ourselves. I showed in conformation and obedience for 20 years, taught obedience classes for 8 years, a rescue area coordinator, dabbled a bit in agility, and then I found I wasn't having fun anymore, so I quit. It's been 10 years now, and Kissy has convinced me that perhaps I miss obedience training. I was excited to see several people in my area on this board...I would love to get together with any mastiff folks. I live out near Bee Cave, west of Austin. Nice to meet you all! See my wonderful girl below---at 1 year, 2 at 6 months, and then when we got her at 3 months. (Yeah, I know she's not conformation perfect...but she's spayed and she is a Best in Show in my heart). 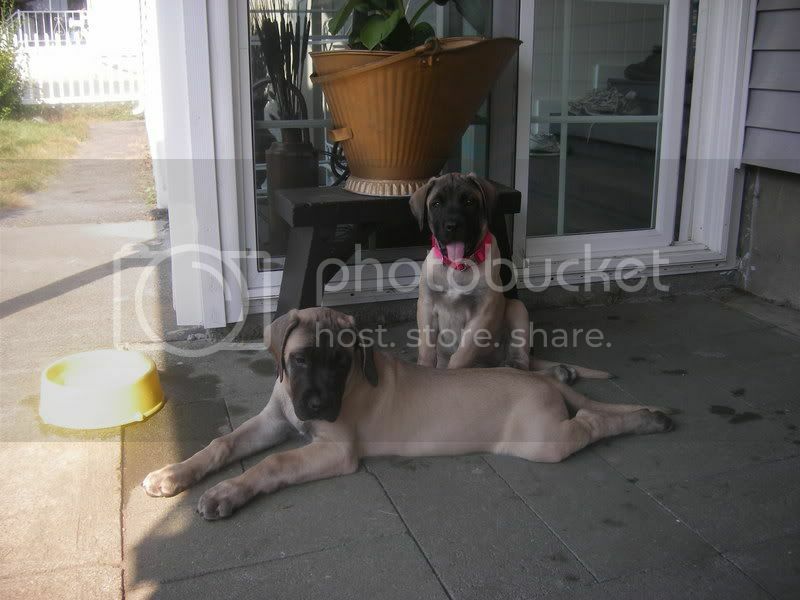 We are John and Ankie, we have Mastiffs since 1988. 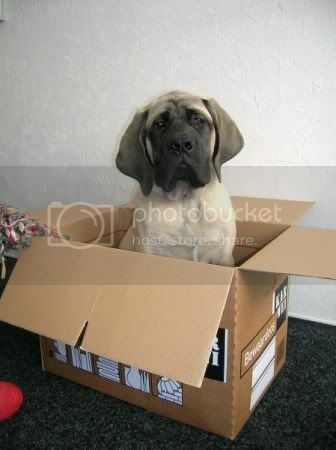 We live in Holland with our Mastiff dog Mr Magnanimous van de Gerelshoeve. Nice to meet you all and good luck with your Mastiffs. Have been reading the boards for a little while now and thought I would say "Hello". We just got our first Mastiff and are really enjoying having him in our family. We are not breeding or showing, and do not ever plan too...he is just a member of the family. He is 13 weeks old now and weighs about 32 lbs...so small compared to what I've been reading. I am not concerned about his size...someone on another post said it best, "he will be as big as HE'S supposed to be". We are entering week 4 of our puppy training classes and he is doing great. I do have a question though...we had a microchip inserted, but I was curious if there is a reason to really register him with AKC if he is only going to be a pet? I am not sure if I know of a reason other than breeding or competing. Dear CashTastic, Hi and very welcome. I am also only a new member myself, but I am afraid I have no manners at all and did not properly introduce myself. I was reading your post, and just would like to give my reason why I microchip my dogs. My main reason was if one of my dogs for any reason got lost, or wandered off, someone could unknowingly leave a gate open, where is my head, I actually did it to a friend once, thank heaven the dog didn't get off his bed. Or a storm may frighten, a car backfire, who knows. Just to be safe in the event of my dogs going missing. Hope this has helped. 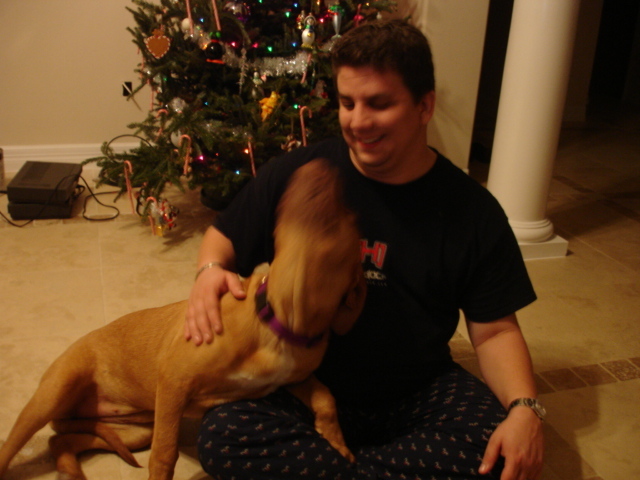 My name is Rebecca and my fiance and I have been involved with dogs all our lives. He has been involved in Mastiffs for many years, his ex-wife has a well known kennel in Scotland. I've been viewing this site for a while now and thought it best to introduce myself! After months of lurking and learning I am finally officially joining "the forum". I have learned SO much and feel like I know so many of you just from reading your posts. My name is Lori and I live in Texas with my husband Steve and our 3 kids Angie (11), Jenna (6) and Andrew (3 in January). We also have an old pound hound who will be 14 in January. He has been with us since he was about 12 weeks old so pretty much all his life. He has been and still is such a great pet and companion for all of us. 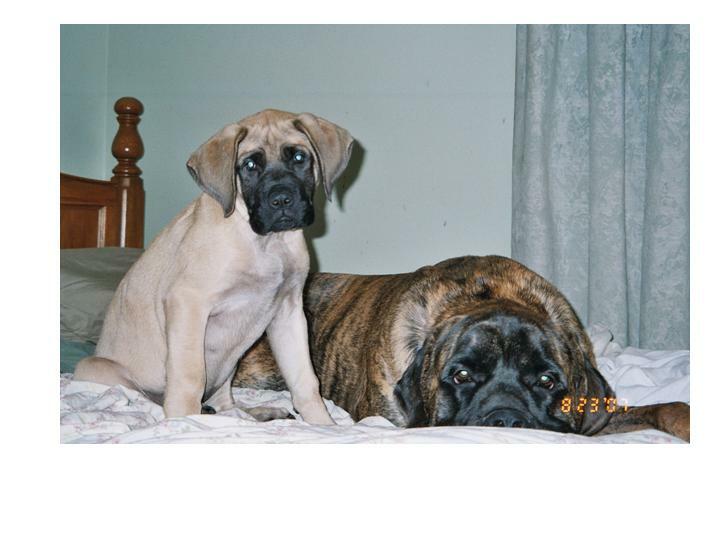 We have wanted a mastiff for about 13 years now and spent the last 3 researching bloodlines and breeders. We plan to show our girls next year when they are old enough. Our daugher Jenna has Spastic Cerebral Palsy and does not walk (YET) so getting our dogs their CGC and possibly into Therapy is also one of our desires. I just want to say "Thank You" to Linda for creating the forum and all of the rest of you posters who have shared so much of your time and knowedge on this board. My name is Megan and My husband's name is Roscoe. 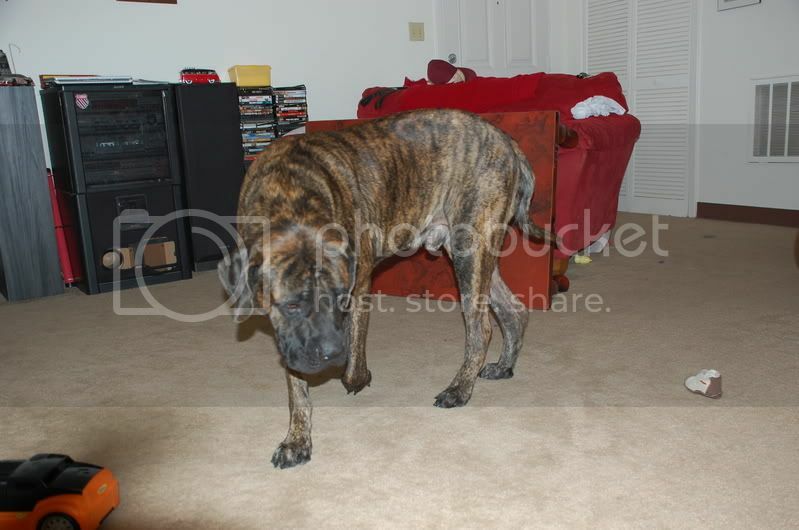 We have one English Mastiff he is 21 months old and 141lbs, he is our biggest baby. We have 3 other children; our youngest is 9 months old and then we have a 2 year old and a 4 year old. We also have 2 cats and a handful of hermit crabs. We've just moved to southern GA from southern VA and we are adjusting quite nicely. Here are a few pictures of Diesel our pup. Since I jumped on to hijack Maria's post I should introduce myself. My name is Lora, I'm owned by Angus (almost 2) and Maggie. (almost 4). I live in Northwestern Indiana. Angus is my baby boy...Maggie rules everyone. 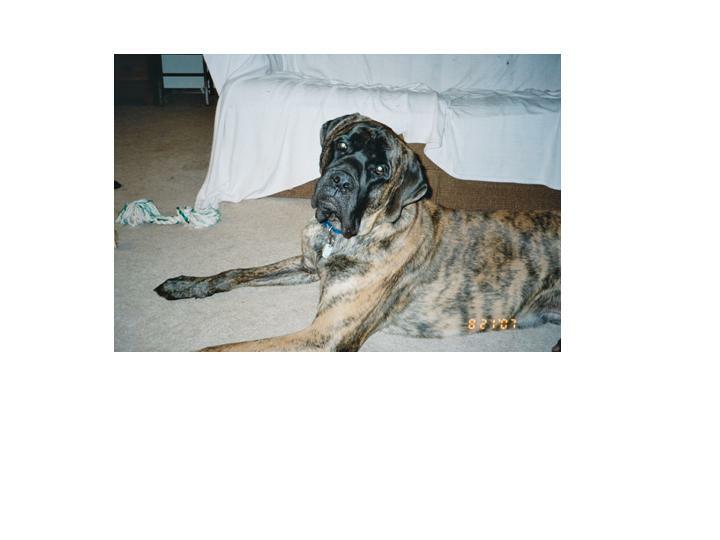 Great Lakes Mastiff Rescue, Inc "Throwing a lifeline to Mastiffs in Need"
My name is Molli, and I live in Indiana. I don't have a Mastiff yet, but I am eagerly awaiting a daughter of Lazy D's Fortunate Son Of Marv (Pork Chop) and Bearhill's Timeless Beauty of Millbrook (Sophie). The litter was just born November 18, and I can't wait to bring home my girl! My other animals include Domino a 2 y/o Dalmatian/Pit Bull, Rocket a 14 y/o Golden Retriever/Border Collie, Spice 2.5 y/o cat, and 9 horses. All of my horses are Arabians with the exception of two, of which one is a NSH and the other is a Mustang. I look forward to meeting fellow Mastiff lovers and owners both on here and at shows! Hi...as you can tell from my screen name... i'm Michelle from NewYork. 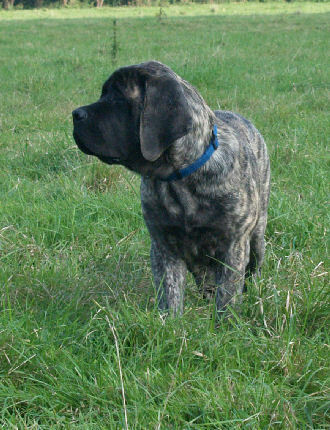 Although i am not owned by a Mastiff as of yet.. i have started proceedings to adopt one. I just found this wonderful forum and i can't wait to learn.. and enjoy .. all that you have shared on here. I am a stay home mom of 3.. and a little nervous about adopting a mastiff.. but just know in my heart its the right thing for myself and family. I've grown-up with dogs for most of my childhood and i think it would be a wonderful experience for my children..A famly member is on her second mastiff.. and i've been in love with this breed since her first one was a pup. I had heard that they are great dogs for children but I didn't expect this much at all. Of course they are always supervised as my wife is a stay at home mother as well. I think you will be very happy as long as you find the time to socialize and train him. 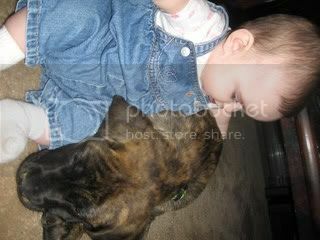 Here is a picture of Cash and our little girl when Cash was about 9 or 10 weeks old...the only difference now is she can crawl under him but they are definitely buddies. Our daughter was 5 months old when we brought Diesel home and our oldest had just turned 3. 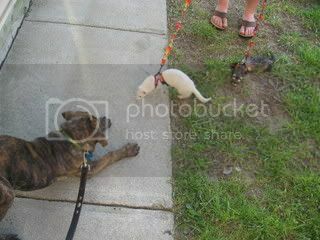 We also had 2 cats and two ferrets that he LOVED, here's a picture of him and his new ferret friends at the time. 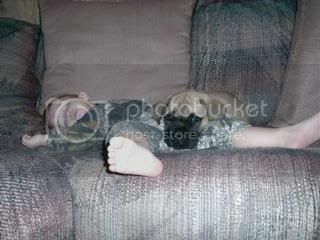 And to think, we were told it was a bad idea to bring Diesel into our family, which had such young children. The people who said that couldn't have been any more wrong. Welcome to the board! I have enjoyed it here since I joined! 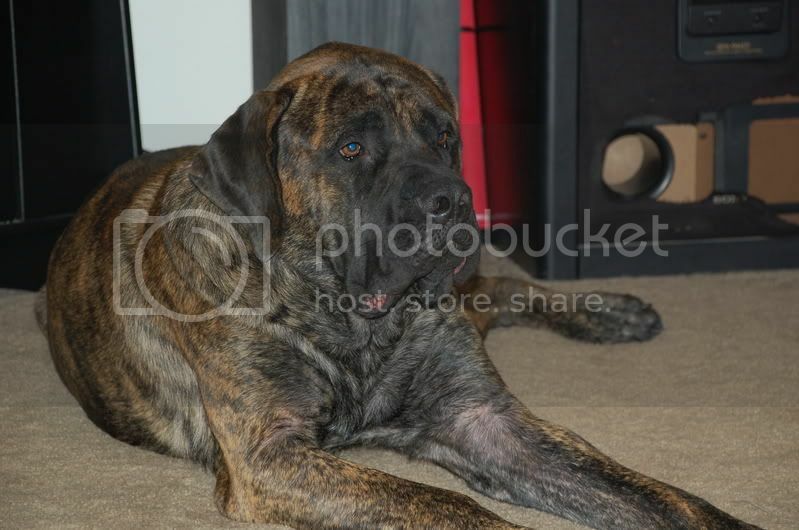 My name is Meredith and I am a proud owner of a 4 year old female English Mastiff, name Harley. 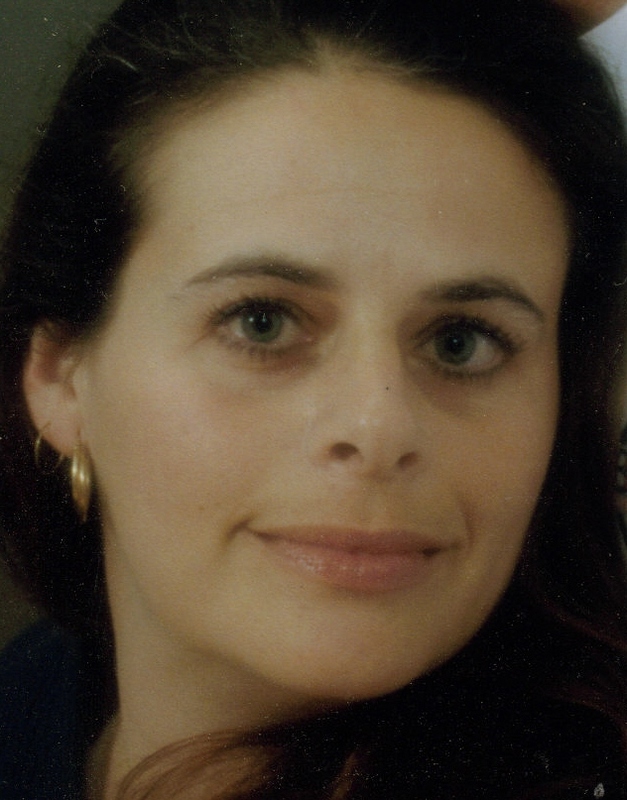 She is very good with my child and she is a wonderful caregiver. I am glad I found this site. I actually have noticed that Harley has bumps on her ears flaps, it does not bother her but I need to address this issue. One of the member of this site suggested looking at a previous thread and reading the directions on the thread to make purple cream for the ears but I cannot find it, any ideas. Hi, my name is Brook. 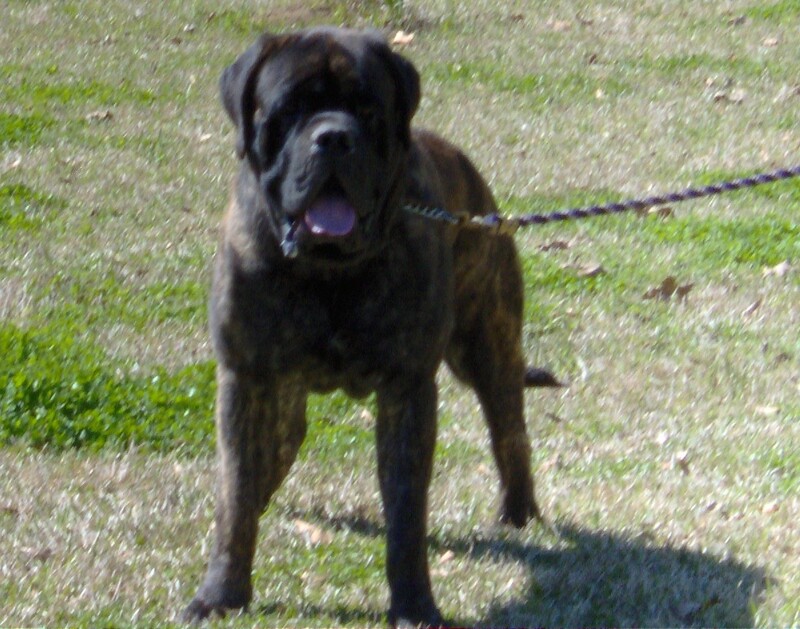 My husband and I and our 3 children are welcoming a mastiff into our home tomorrow. A little girl named Noelle. Just wanted to say HI, and I'll post pics as soon as we get home. We have had 2 labs in the past, they were rescue dogs, and our babies... one passed away old and one was stolen and taken out of county several hours away.. we have been unable to get law enforcement in that area to retrieve her.. it has been almost 3 years now.. so I doubt we will get her back.. we would go ourselves but the man who stole her (we found out from his brother) is not known for being very nice, and is known for some illegal activities, we have called animal control where he lives now but since we don't have his address, only the county it seems they won't do anything.. .. We currently have a rescued golden retriever/lab mix, and a border collie/lab mix he was given to us by a neighbor as a Christmas gift for our children.. both of them however are 80% outside dogs... rarely do they even WANT to come in the house.. However, Soko, will be 100% house dog except when he is out with us.. we are out a lot though. So since this is our first mastiff.. I was googling for forums to ask questions on.. I have read, and read, and read all about them.. but I am sure as Soko grows we will have questions, so I wanted to have somewhere to go with those..
Any and ALL information you all can provide from your experience is GREATLY appreciated..
My name is Magda. I am from Poland. I have dogs from 20 years. I'm bullmastiffs and mastiff breeder. I have bullmastiffs from 11 years and mastiff from 3 years. I have 12 bullmastiffs and 1 mastiff female. All my dogs lives in my home with me. My husband and I have been enjoying your forum for some time now and since we are spending more time in the office now that we have turned the office into a nursery, I'll have a little more time on the computer. 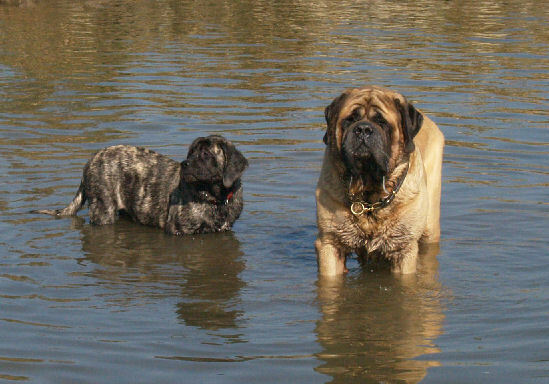 We have been Montana State co-ordinator for Mastiff rescue for 8 years. We have been in MCOA since 1997, I think. 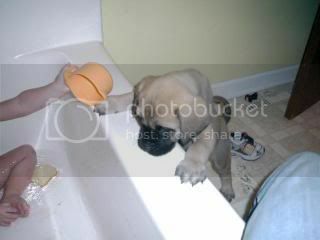 We've owned Mastiffs for 12 years. Right now we have two females and 8 brand new puppies, born today out of Ch. Lynnspride Montana's Cascade, CGC TDI and Ch His Majesty Mighty Joe Young Bearhill. We have been doing therapy work with our mastiffs for 5 or 6 years. Hi everyone, my name is Karyn and my mastiff's name is Oso-it means bear. He will be two in February. 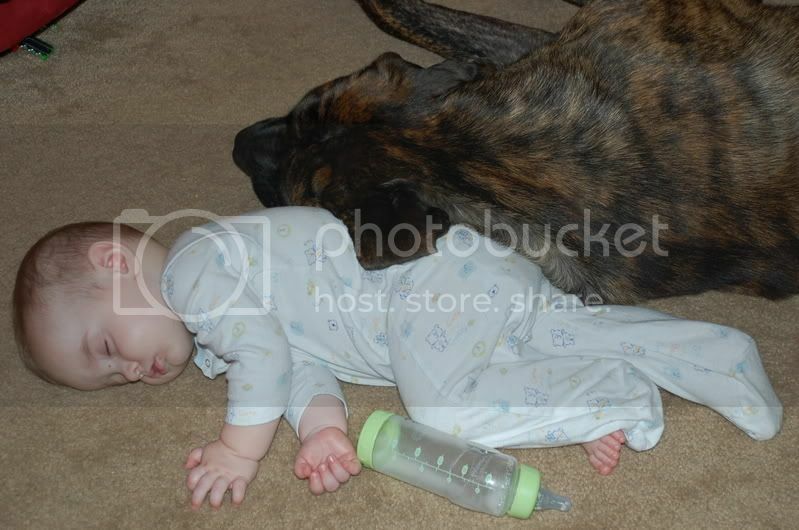 I live in Il with my mastiff, a ferret, my husband, 16yr old son, and 13 month old son. I have been pressuring my husband into getting another dog to be Oso's play buddy, all he has now is a beagle when my sis comes, o my other sis has a dalmatian. I LOVE to talk about my dog, and I have plenty of pics! Hello! I am "MolsonsMom!" 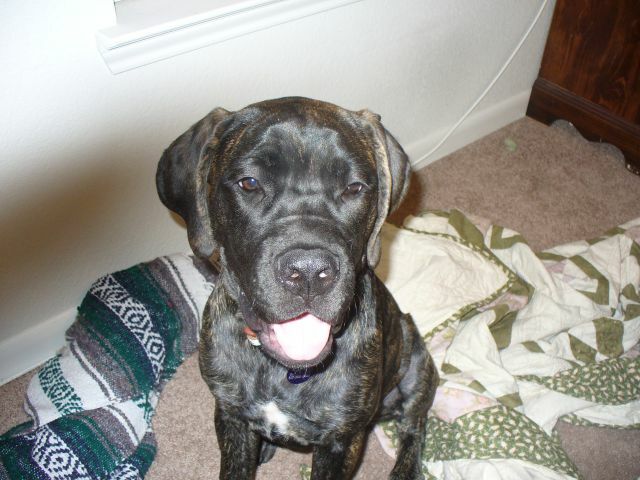 My husband & I just aquired our first Mastiff a few days ago & we love him! 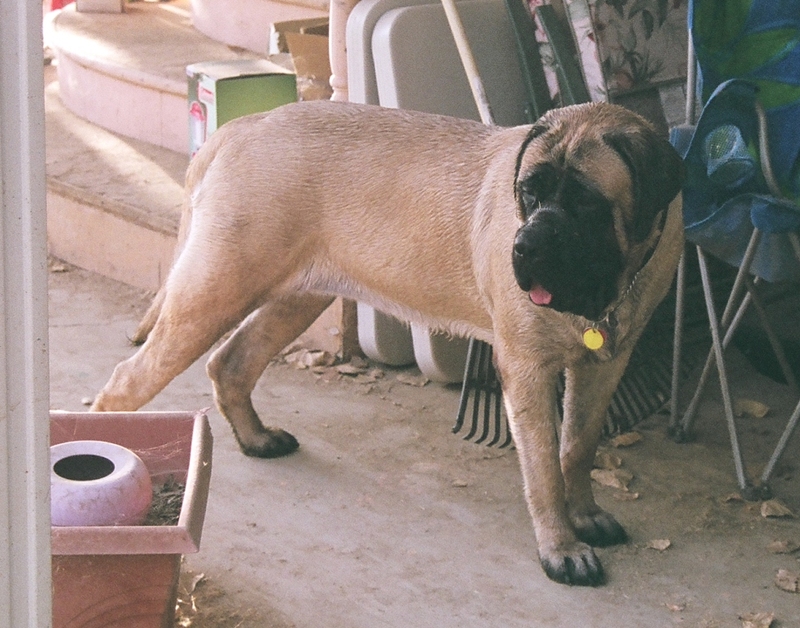 We have owned large breeds in years past, but never an English mastiff. So please bear with us, as we are learning! As soon as I get some pictures of our baby Molson, I will post them. Hello My name is Darlene .I have been lurking for about a year. My husband and I live on 20 acres in Indiana. We just got our 4th mastiff Christmas Eve. Gracie will be 3 in March.Sophie will be 2 in April, Levi is 16 weeks and Dozer is 7 weeks.They are all just pets.